Epact: Navicula Dial unsigned, 15th century ? This is an example of one of the most rare and charming designs of early sundial, the 'navicula' or 'little ship of Venice'. The navicula is a form of altitude dial similar to the Regiomontanus type. 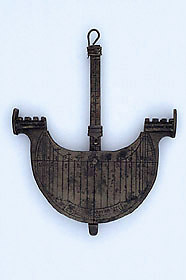 The main body, engraved with the hour-lines, is given the shape of a ship; in this case the sights are incorporated into a castellated 'poop' and 'forecastle'. The 'mast' carries the suspension for a plumb-line, adjustable for date and latitude.